What is massage therapy? Massage therapy is a type of bodywork where the therapists works in several different modalities (or techniques) to manipulate soft tissue to help increase function and induce relaxation. Massage can also help increase circulation by bringing oxygen and nutirents to the tissues, decrease inflammatioin, increase flexibility, reduce muscle tension and pain, reduce pain & stiffness in muscles & joints and much more. The benefits are endless, and we at Complete Care have a great team of therapists to help you with your specific needs! We are all trained in several modalities, and some of us specialize in certain fields. In today's blog I will share with you some different types of massage therapy to give you a better idea of what you may need for your specific needs. And always feel free to call or stop in with any specific questions, our therapists would be happy to answer them for you! relaxing, creating a smooth, flowing type of session. Those who like relaxation massage can also request firmer pressure with the same flowing session. If you've never had massage before, trying out a relaxation massage is a good way to start out. expectant mothers and recommended by many doctors. Therapists knwo the proper way to position and support the woman's body during the massage, as well as how to modify techniques for her comfort and saftey. Pregnancy massage is used to reduce stress, decrease swelling, relieve aches and pains, and reduce anxiety and depression. At Complete Care we have our prenancy pillow in which the expectant mother can lay on her stomach all the way to full term, a woman's best friend towards the end! not onlyrelax but help achieve overall healing and balance for the entire body. Reflexology is very relaxing, and perfect for the person who wants a shorter session and someone who works on their feet all day. You wont even have to get undressed and will feel the benefits everywhere! for someone weary about massage work, but looking for some healing or overall wellness. techniques we can use for optimal results. Swedish massage. The focus isn't on relaxation but on preventing and treating injury and enhancing athletic performance. A combination of techniques are used including stretching and joint mobilizations. Great for the younger kids, athletes and those who work out often. especially to touch-deprived elderly clients. This is only the tip of the iceburg when it come to massage therapy and the different modalities out there. Other types of massage include Thai, Shiatsu, Orthopedic, Polarity, Cranial Sacral, Hot Rocks and many many more! and hope you take advantage exploring the different areas of massage therapy! Cupping therapy is an ancient technique used as early as 3,500 years ago by the Egyptians as well as by Hippocrates in ancient Greece to cure many ailments. Still it is used today to compliment many therapies and bodywork including massage, detoxification, spa treatments, lymphatic drainage and myofascial and triggerpoint release. A common Chinese practice, cupping is a simple way to produce big results. Cupping originated with the use of animal horns to create a suction over the skin to drain out toxins from snake bites and skin lesions, and eventually graduated to bones, shells and eventually glass. The use of a cup is to create suction against the skin's surface where the cup is placed to create a negative pressure; this softens tight muscles, drain excess toxins & fluids by opening lymphatic pathways, loosens adhesions, lifts connective tissues, and increased circulation to the area treated. Cupping therapy can be used for conditions such as Fibromyalgia, Neuromuscular dysfunction, cellulite and scar & stretch mark reduction as well as general detoxification, wellness & relaxation. The cups are placed on the body by an experienced practitioner and a level of suction is created in an area of stress or tension. The cups should only be left on a few minutes to achieve desired results. The longer the cups are left on, the more blood is pulled to the area. Very quick bruising and cupping 'hickies' are occur with the placement of the cups, and the longer left on, the more intense the markings. My markings shown lasted about a week and a half. The treatment is not uncomfortable or painful unless too much suction is brought to the area, which is easy to reduce with the knobs on top of the cups. The cups can also be moved along the body while suctioned and perform a type of deep tissue massage, which may I mention is much easier on the therapist. It picks up underlying tissues and and get deeper quicker than regular manual therapy. Be well, Namaste and happy cupping! image source: my cupping session! Often times when you mention energy work, including Reiki, Polarity, Chakras and Auras people's eyebrows raise and the skepticism kicks in full force. Witchery, voodoo and plain 'hooey' are what comes to most people's minds who don't understand the make up of the human body and it's relation to the rest of the world. Reiki is a Japanese technique for stress reduction & relaxation that can facilitate healing. It's based on the idea that we all have a 'life force' energy in us that animates us & promotes our wellness. When our energy is low we are more likely to feel sick and have 'dis-ease'. If our energy is high we feel healthier & happier. Now it's how and why energy work has its place in the world I would like to share. Way back when you were in elementary school you listened to your science teacher drone on about molecules and how everything is made up of chemical compounds and energy you were more than likely passing notes or doodling in your notebook. Little did you know how much insight you were being given about how this world works, including you! How about physics? Did you learn about matter? I bet they said 'matter is anything that has mass and takes up space'. I bet you they also said that matter is made of molecules and atoms that contain particles like protons and electrons. Now fast forward a few years into biology and you start studying things like cells and the basic make up of living organisms including the human body. Molecular biology and physiology discuss the make up of the human body which includes atoms, molecules, protons, electrons, neurons and all kinds of chemical processes that are a part of my new-found fascination with the human body and how it works. Now who can argue that the human body is made up of the same atoms and molecules that everything else in the world is made of? And in addition, if matter has energetic properties then who can argue about things such as the electrical currents between the synapses of neurons in the brain? Electrical currents flow all through the body including the nervous system, the heart and circulatory system all working to regulate the body and homeostasis. In my book suggestion you'll see below there is a chapter on the scientific explaination of Reiki energy and energy work. We are of no doubt made up of buzzing energy the same as the desk I'm sitting at and the light beaming down on me through the electrical current activating the light bulb above my head. Energy is defined as the 'ability to do work'. There is potential and kinetic energy.Cars can move because gasoline is stored energy, TVs & computers run on energy and we can move, run and work because be break down food we eat into energy. Energy is always changing from potential to kinetic, called transformation energy. Energy cannot be created or destroyed, it can only be changed from one state to the other. Now back to the voodoo of energy work. Now the idea behind energy work is that we can promote balance and harmony to the body by manipulating the energy fields surrounding it. If the energy field is blocked or disrupted this can promote illness and dis-ease. The fact is energy work is quite ancient and has been around for centuries. It is based on the 'life force' or 'qui' in Traditional Chinese medicine. The Chinese systems of meridians maps out energy pathways that supply vital energy to our physical and subtle body. The subtle body includes the energy field surrounding it. Chakras are like energy transformers found in the body that promote health and healing. They take the life force around us and transform it into energy we need to sustain balance. The are seven chakras starting at the base of the spine and work up to the crown of the head; if they are disrupted or blocked this again can cause unbalance and dis-ease. Auras are a part of the subtle body that extend out from the physical body. They contain many levels of vibration that correlate to the different chakras of the body. Illness can start in the aura, manifesting with negative energy that starts in the subconscious mind. Ever heard of 'bad karma'? Same principle applies to being able to feel the presence of certain people, whether they have good or bad energy. Now Reiki comes from the Japanese words 'Rei', meaning 'God or Higher Power' and 'Ki' which is life-force energy. 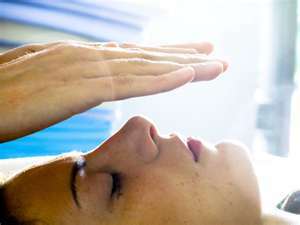 So Reiki is 'spiritually guided life force energy'. It is the laying of hands by an attuned practitioner who acts as a channel to pass needed energy already in and around them through them and to the client in areas of dis-ease. An attunement is a process of getting 'keyed-in' to tap into this energy by a Reiki master. Reiki session can be done fully clothed or incorporated into a regular massage session. The practitioner works a series of areas throughout the body, laying their hands directly on or 'beaming' just over the surface of the body. The practitioner will move on to the next spot once they feel each area has received appropriate time for the energy it needs. Anyone can get attuned by a Reiki master, it does not require super extensive training, and once it's there, it's there forever. When I got attuned I was a bit skeptical, I had not really had good luck working with energy work thus far in my education at IMI. However in this process it was amazing the things I felt and saw! Feeling the passing of energy as tingling and heat came to the forefront for me; and I was able to see colors and auras with my eyes closed of the people in front and behind me! This work is very subtle, and I have had success with it so far in my practice. The transfer of energy can be felt as tingling or heat, or it can be so sublte that you don't feel much of anything but the work is still done. Reiki can never do harm, it can only add energy in places where you need it or be done for an over-all feeling of balance. Be well everyone! What the Heck is Lymphatic Drainage? What the heck is lymphatic drainage? That's what I said when I started massage school and was looking through my possible electives. So many of the modalities of Myomassology sound so complicated and foreign that I wouldn't feel comfortable asking for the services, let alone anyone who is not in the massage therapist world. Learning so much about the body, how it works and how fascinating all of the different systems are & how they work together I'm learning more and more how important bodywork is. As a society we get so caught up in the daily routine of work, school, kids, carpools and house work it is easy to push aside taking care of ourselves. 'As soon as things slow down' or 'as soon as I get through this month, I'll get back on track and start taking care of myself'. I say that all of the time, heck I said it last week! But the truth is that life is truly what happens when we're busy making other plans, so chosing a way to be and live your life on a daily basis is the way to actively play a part in who you are and will be for years to come. And being active in your bodily maintenance and well being I feel is the best way to ward off illness and live a long, healthy life. Bodywork has so many subtle techniques that can make just the world of difference in how we feel from day to day. This is what I learned when taking an introduction course in Lymphatic Drainage (pronounced dra-naj) at Irene's. This technique is a very light touch that facilitates in the removal of excess fluid built up in the body. Your lymphatic system is an extensive drainage network in the body that stimulates the immune system and helps keep fluid levels of the body in balance. It is a network of conduits (or ducts) just below the skins surface that carry a clear fluid through the body called lymph. Two-thirds of the body's water is intracellular, or inside the cells. The remaining third is extracellular, or fluid around the cells. This one thirds main component is interstitial fluid. It is the lymph systems job to collect this fluid (where it then becomes lymph), containing plasma and protein to the blood to go back up to the heart and into the cardiovascular system where it can be filtered and eliminated. Lymph contains many things, some things the body needs and some things that it doesn't. When lymph is collected by a series of channels it is filtered as it moves along and collects in the lymph nodes. These nodes are kidney-shaped organs located in the jointed areas of the body. They produce lymphocytes that capture and destroy pathogens and help filter the lymph. When this interstitial fluid builds up it can result in edema, or swelling. Lymphatic work is light, precise and rhythmic-helping to move along any stagnant fluid or lymph in the body. An educated touch can actually feel the fluid flowing just under the skin. This technique can be incorporated into a regular massage session, or entire sessions can be performed using this technique. Lymphatic work can be done to help with minor swelling, sports injuries, achne, trigger points and sinus issues. It's great for detoxing, fibromyalgia or general good health. Be sure to always ask your therapist if they have proper training, as there are many contraindications (reasons to not perform) for this modality such as acute infections and congestive heart failure. Keep in touch and we'll talk about reading food labels. I still need to work on paying more attention when it comes to this, but after reading what I did about food labels it's no wonder we are the unhealthiest nation around! Book suggestion: 'Your Key to Good Health: Unlocking the Power of Your Lymphatic System' by Elaine Hruska.